Sydney: The University of Cambridge has refused a request by an Australian man to return important Aboriginal artifacts taken by British explorer Captain James Cook nearly 250 years ago. Rodney Kelly is seeking the return of four spears from the university’s Museum of Archaeology and Anthropology on behalf of the Gweagal people, who traditionally inhabited southern parts of Sydney, Australia's largest city. According the to the university, Cook took the spears following a violent first encounter between Aborigines and Europeans on the shores of Botany Bay in Sydney in 1770. He also took a shield, which is currently held by the British Museum and for which Kelly has also sought repatriation. The artifacts are recognised as a significant symbol of first contact between the British and indigenous Australians and of Aboriginal resistance to colonisation. 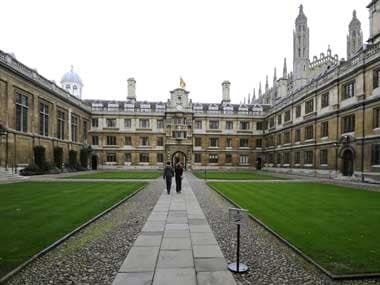 However, the University of Cambridge has rejected a request for their return lodged by Kelly. "Removing parts of the Cook-Sandwich collection, which is of great historical, scientific and educational importance nationally and internationally, would cause considerable harm by depriving the collection of its integrity," a spokeswoman said in a statement to Reuters on Saturday. The university said the request contained no clear proposal for housing and conserving the spears if they were to be returned, and added it was important that any request for change be made with "accredited representatives of the Gweagal people". Kelly, who submitted a formal request for the repatriation of the spears in November 2016, claims to be a direct descendant of the Gweagal warrior Cooman, from whom he claims the spears and shield were taken. However, a report prepared by the University of Cambridge has questioned Kelly’s ability to prove his descent - something disputed by the Sydney man. "It makes me angry they are trying these tactics to discredit me and my history," Kelly told Reuters in an interview. Cook's landing in Botany Bay on April 29, 1770 marked the first point of contact between the British and Aborigines and preceded the arrival of the first waves of colonists to Australia eight years later. Two Aboriginal men holding spears tried to resist Cook’s party landing and one was injured by British musket fire, the university says. The Gweagal then retreated and Cook and his crew entered their camp and took the spears and a shield. According to Kelly, Cooman was the injured man in the historical account, a claim the university says is not well-supported. Both the Australian Senate and state parliament of New South Wales voted last year to support the repatriation of the artifacts from the British Museum and the Cambridge Museum of Archaeology and Anthropology. Kelly said he would continue to fight for the artifacts' return. "I want to do everything I can to bring those artifacts home for my people and every indigenous and non indigenous person in Australia," he said.